How about some rainbow bacon? Sure to wake up your friends (and make them question your sanity), this rainbow bacon may just ensure that you get as many pieces as you want to yourself! It seems that the person who made this bacon individually soaked raw pieces into food coloring, and then pan fried it. Would you try this? If you do, send some pics/video my way and I’ll post them. This may be one of the few activities I’m too chicken to try myself. 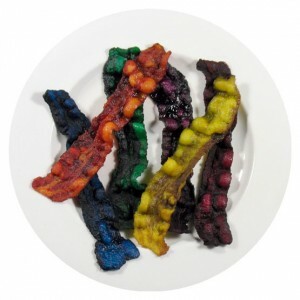 *Rainbow bacon may also work well for St. Patrick’s Day, Valentine’s Day, or Fourth of July. No better way to celebrate America than by dying fatty food to match our flag! God bless our country.